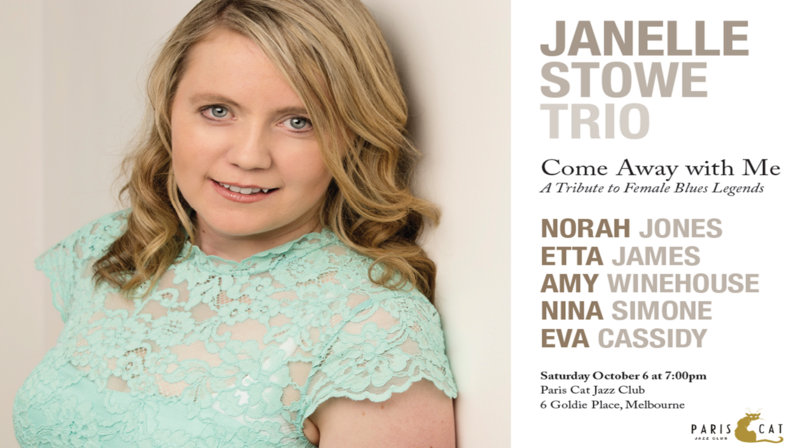 COME AWAY WITH ME - A tribute to female blues legends Norah Jones, Etta James, Amy Winehouse, Nina Simone and Eva Cassidy. Come Away With Me is an intimate evening of live jazz/blues music and narration attributed to the stellar vocals and life of female blues artists Etta James, Norah Jones, Amy Winehouse, Nina Simone and Eva Cassidy. ​For this tribute we present Hobart jazz singer Janelle Stowe accompanied by Berklee & GIT alumni Brendon Siemsen on guitar and Evan Carydakis on the sax. You can expect to hear artistic interpretations of tunes including ‘At Last’, ‘Come Away with Me’, ‘Back to Black’, ‘Feeling Good’, ‘Stormy Monday’ and many more with a soulful jazzy feel. Click on image to view PDF version.